I had fun doing some thrifty shopping again this week. My bounty wasn't huge, however I fell in love with it all. I am linking to Thrifty Thursday @ Tales From Bloggeritaville. Be sure to visit and see all the bargains everyone has found this week. I love to find pretty small bowls and dishes to use on end tables to hold candy or nuts, or to just look pretty. This little bowl has such a beautiful pattern and colors. For $1 at GW, it was definitely a keeper. I'm sure it is really old too. This is the mark on the back. This is the mark I found on the back of it. I love pretty white bowls and the raised intricate detail on this one is stunning. There aren't any markings on the back. It cost $2.99 at GW. A pretty little pitcher that again had a beautiful design on it. $1.99 at GW. 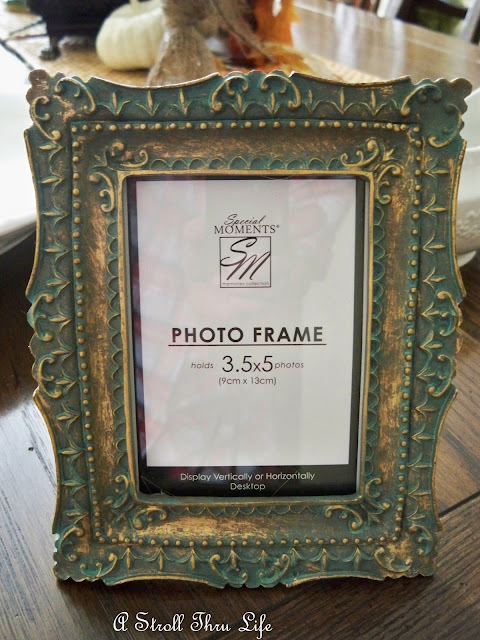 I've been on the lookout for some new picture frames with a little personality. This one came from the Dollar Tree. So only $1. It will probably get a new finish. 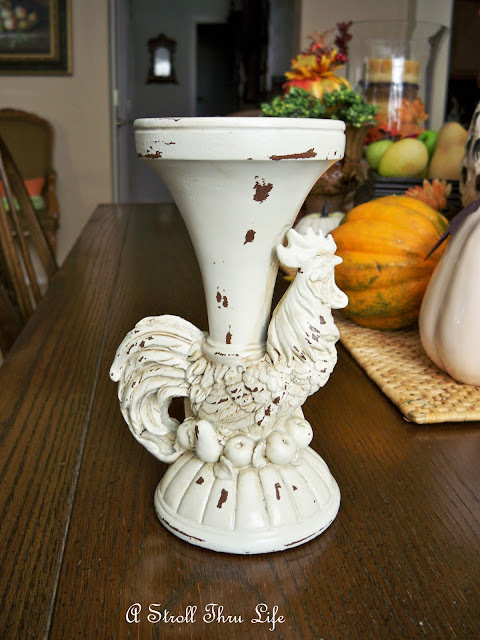 Now all of you know that I LOVE roosters, so when I saw this candlestick at Ross, of course I had to have it. Love the chippy white finish and only $5.99. A few fun finds, now I can't wait to play with them all. I see your comments on other blogs so followed your link. You have some great finds.I would love to treasure hunt like that but I am "full up." Can't find room for what I have, much less anything new. Wish you could shop my discard pile. Fairfieldhousenj.com was hosting a blog sale. Next time she does that I should join in. I have lots to sell. I'm jealous.. love that white dish with the raised florals.. you did GREAT, Marty. Hi Marty! Oh, I think you made a pretty good haul!! The plates are so lovely and I'm coveting big time that darling Rooster candelstick. I'm going to see if I can find one too! I love your platter with the raised detail. I'll bet that will get used a lot. Great finds! I can't choose a favorite! I would have bought everything you did!!! Love the plates, bowls, candlestick! wow!! Wow! You did great this week! I love the white bowl and gravy boat! But I really LOVE that candlestick from Ross w/the rooster! I love the color and chippiness and of course the rooster too! It's wonderful! Oh, Marty, all your Goodwill finds are lovely!!! I especially love the bowl and plate. And Ross is one of my favorite stores. I can pretty much always find something there that I HAVE to buy...usually it's a dress, but I HAVE found some great home decor there. Great rooster you found!! Tomorrow I'm hitting my Goodwill. I have a 20% coupon that expires tomorrow, so I'm hoping to find a bunch of goodies (20% off your entire purchase). When I drop off my donations, instead of getting a tax receipt, I get the coupon. All fabulous finds Marty BUT that rooster is positively WONDERFUL!! He would have come home with me if I'd seen him first, lol! Love the white rooster the best. Those are some wonderful buys! I love them all. I love the rooster. I look forwarding to seeing how you use him. Very pretty finds Marty. I love that rooster candle holder! I can just imagine what you will do with these! I love white also! Ohhh...Girlfriend, you always find the best stuff!!! 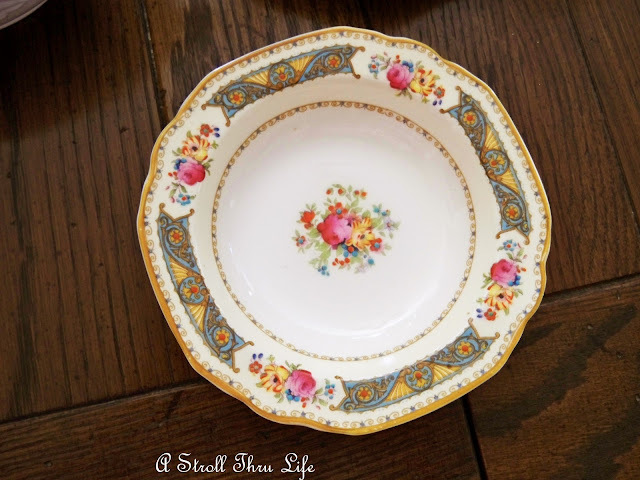 The detail and colors on the china bowl and plate are simply gorgeous! What a great find for just $1! 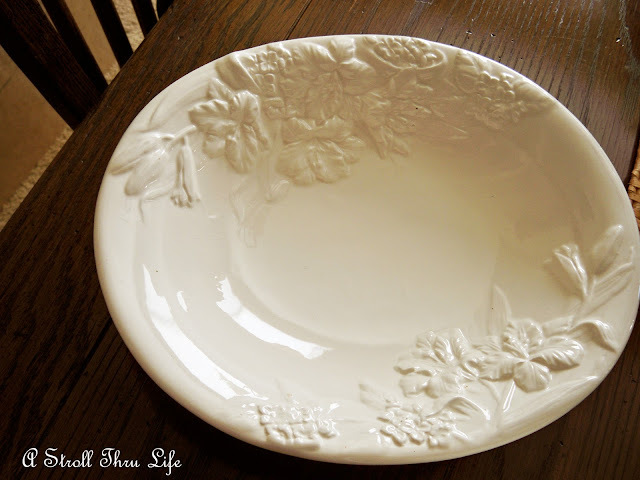 And...I love the white embossed dishes! Marty, the rooster candleholder is soooo pretty! I love that! I can just see it now...I know that you'll be finding all kinds of ways to showcase this pretty candleholder in your vignettes! Can't wait!!! Well dear lady, thank you so much for coming by and taking a peek at my "autumn tablescape in a basket"! Your sweet notes always make my heart smile! Love ya, my friend!!! great finds! I especially love the rooster! LOVE those dishes -- I can't resist the odd beautiful dish either, especially when it's only a buck. The rooster is adorable, too -- but I can't believe that frame. Wow -- I have not been to DT in awhile... must go NOW. G'day Marty ~ Sha-ZAM! You really found some beauties here. Our GW is a joke, I'd sure like to have one like yours. Marty, you always luck up on the best deals. Those plates and bowls are so pretty. I am sure you got a great deal on those. The rooster is a must. I would have snatched him up, too. My favorite was the gravy boat. So fallish. It just got better and better, as I continued to scroll down! 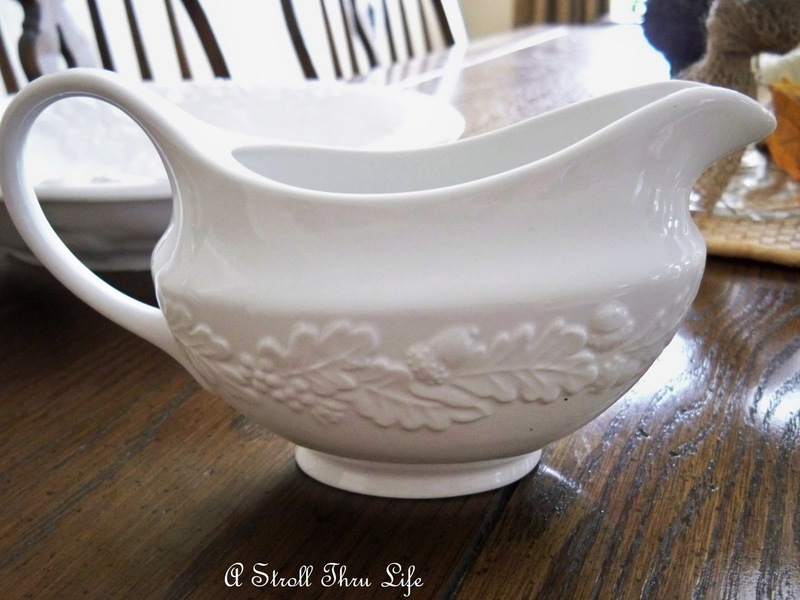 I absolutely love the gravy boat and the white bowl. I went treasuring hunting today too! Only found one white plate. Nice finds! You did good in your bargain shopping. I made a little run to the Sweet Tea Consignment Shop at lunch today. I'll share my goodies soon. Of course they were terrific bargains. I am so addicted! The shop owner told me to bring some of my stuff in for consignment. I think I will do that. All the cabinets and closets at my house are bulging with all my loot. Again you have scored some great finds! Love the white bowl and the rooster! 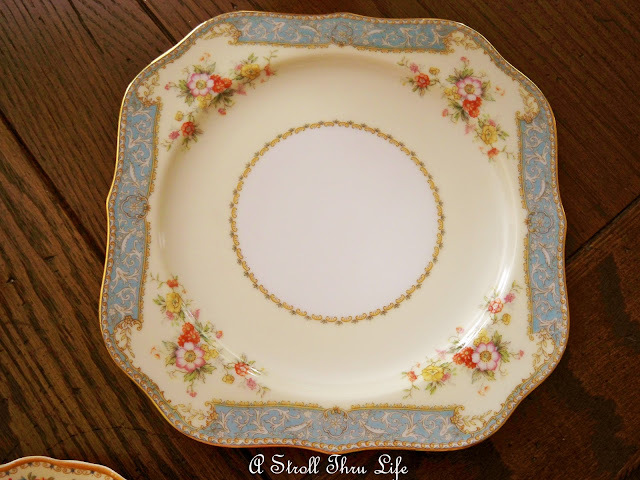 I often see those pretty patterned Noritake plates at GW too! I always like to grab them when I see them. I have 8 bags and a box to drop off at Goodwill tomorrow.........maybe I better go in? Great finds! What great finds. 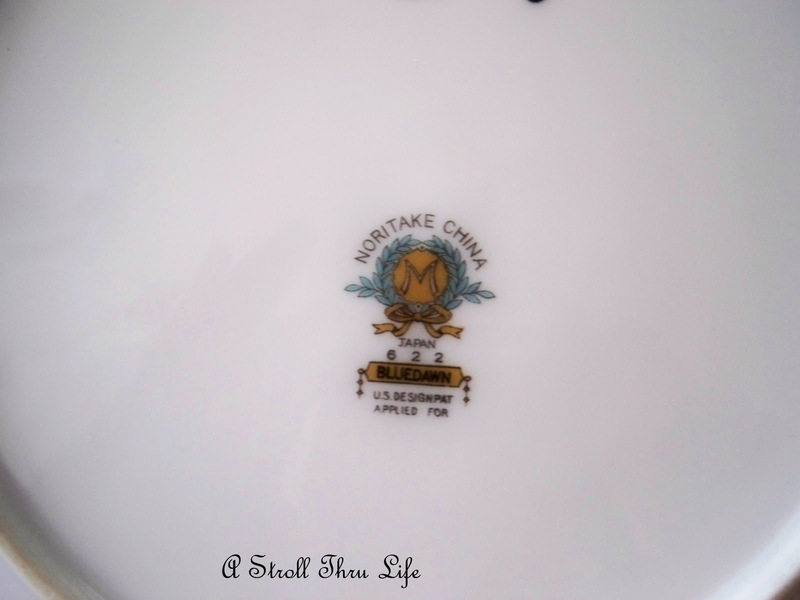 Noritake used to make the most gorgeous china. I'd love to find a whole set of them. YOur plates are beautiful! Our GW is expensive, very proud of their junk, and most of it is junk. Nothing worth what you got! Love your rooster candlestick. You did well today! Let me say, that you have the best luck at GW. You found some really neat things for great prices. Love the new candle stick. 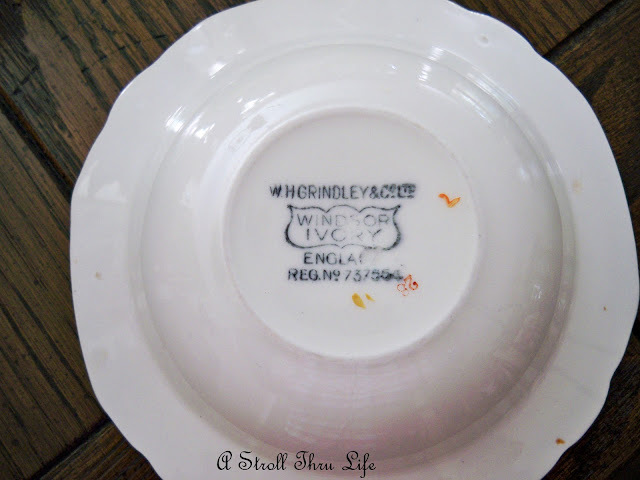 Love the Grimwades dish - I've checked the registration number in one of my books for you (This is the year the design was registered, not the actual manufacture date) numbers 725899 to 740458 were registered in 1928. I'd imagine that the pattern wouldn't run on for more than a couple of years. The Noritake is sweet too, and I love the rooster candlestick. Great finds! Can't wait to see what you do with them in upcoming vignettes! Love those pretty little plates! 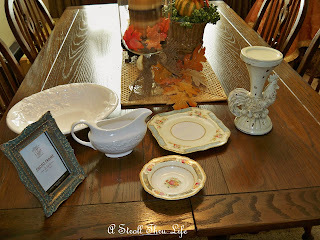 I went to an estate sale today and bought a few things, I'll blog about them soon! Very pretty, Marty! The white can be mixed in with so many things! Oh Marty...everything is gorgeous! I also like to buy plates and bowls, either to just look at, or sometimes fix myself a "special" lunch on! I haven't heard of Ross. Is it a local store? As always, I love everything that you found. The little plates are so sweet and that rooster is great! Marty, you're the grand diva of bargain shopping! I wish I had your eye.